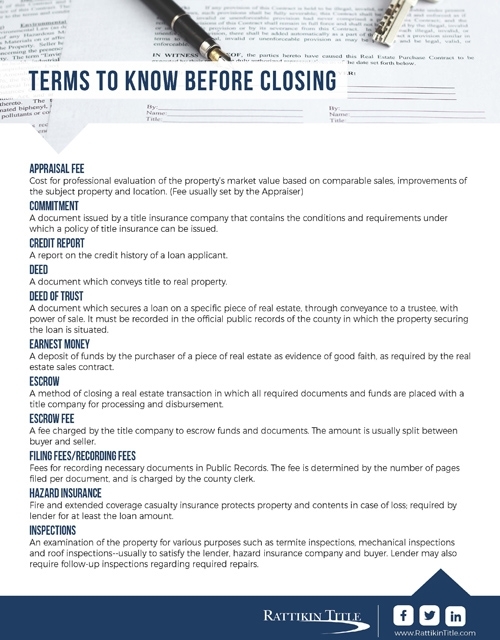 A document issued by a title insurance company that contains the conditions and requirements under which a policy of title insurance can be issued. A report on the credit history of a loan applicant. A document which conveys title to real property. A document which secures a loan on a specific piece of real estate, through conveyance to a trustee, with power of sale. It must be recorded in the official public records of the county in which the property securing the loan is situated. A deposit of funds by the purchaser of a piece of real estate as evidence of good faith, as required by the real estate sales contract. A method of closing a real estate transaction in which all required documents and funds are placed with a title company for processing and disbursement. A fee charged by the title company to escrow funds and documents. The amount is usually split between buyer and seller. Fees for recording necessary documents in Public Records. The fee is determined by the number of pages filed per document, and is charged by the county clerk. Fire and extended coverage casualty insurance protects property and contents in case of loss; required by lender for at least the loan amount. An examination of the property for various purposes such as termite inspections, mechanical inspections and roof inspections--usually to satisfy the lender, hazard insurance company and buyer. Lender may also require follow-up inspections regarding required repairs. A voluntary (as in case of a mortgage), or involuntary (as in case of property taxes), charge or claim imposed against real property. Paid to the lender at time of application; check with lender for amount. A title insurance policy insuring a lender, or beneficiary under a deed of trust, against loss caused by invalidity or unenforceability of a lien, or loss of priority of the deed of trust. A fee the buyer pays a lender to originate a new loan. A title insurance policy insuring an owner of real property against claims of others in and to the property. Any exceptions or exclusions are listed in the policy. A fee that may be charged by a lender for prepayment of a loan balance prior to maturity of the loan. (PMI - private mortgage insurance- conventional loans, MIP-mortgage insurance protection-FHA loans) Insures lender against loss in the event of default by the borrower in payment of the loan. Taxes are prorated with the Seller paying taxes from January 1st through the closing date. Figures are usually based on actual taxes owed the prior year, without any exemptions. Any shortages or overages due at the end of the existing year are split between Buyer and Seller. An amount paid to the Realtor® as compensation for his/her services per the real estate sales contract. A set of limitations on the use of property imposed or created by deeds or other documents in the chain of title. A restriction, for example, may prohibit the placement of a trailer or the construction of a commercial structure on the property. A depiction of the real property by a scaled drawing reflecting all improvements situated on the property, accompanied by a written legal description, which may be a lot and block description or a metes and bounds description. A survey should reflect all easements, encroachments, protrusions and other items under which another party may claim an interest or right to the property. Report issued by taxing authorities showing the current year taxes, the last year the taxes were paid, and any delinquencies, which will be collected from the seller at closing. These numbers are also used for tax prorations.